Prepared by Scott D. Kendell, MD and Mark S. Collins, MD , Department of Radiology, Mayo Clinic, Rochester, MN. Dr. Kendell is now at Duke University Medical Center, Durham, NC. A previously healthy 11-year old girl with a 4-month history of intermittent, but progressive, left knee pain presented to our institution. The physical examination revealed slight fullness of the proximal left lower extremity compared with the right. A complete blood count and basic metabolic panel were normal. 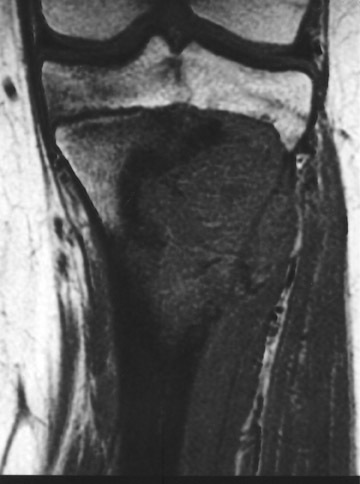 Anterioposterior and lateral radiographs of the left knee were performed (Figure 1) followed by magnetic resonance imaging (MRI) of the left knee (Figure 2). 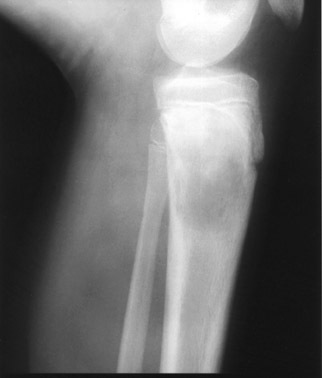 Anteroposterior and lateral radiographs of the left knee revealed a predominantly lytic, permeative lesion in the proximal tibial metaphysis with a wide zone of transition and cortical destruction along the lateral margin of the lesion (Figure 1). 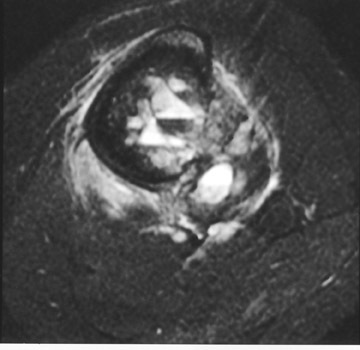 Selected T1- and T2-weighted coronal and axial MR images of the proximal left tibia revealed a 5-cm mass located eccentrically within the lateral aspect of the proximal tibial metaphysis (Figure 2). The mass contained multiple fluid-fluid levels. There was cortical disruption along the posterolateral aspect of the proximal tibia with extension of the mass into the adjacent soft tissues. 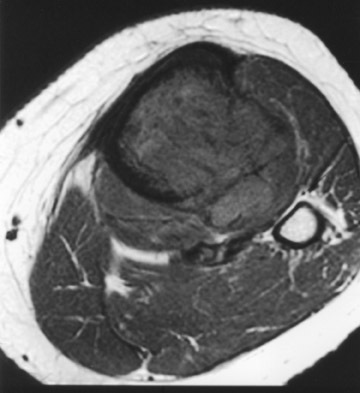 Telangiectatic osteosarcoma is a rare malignant osteogenic tumor. 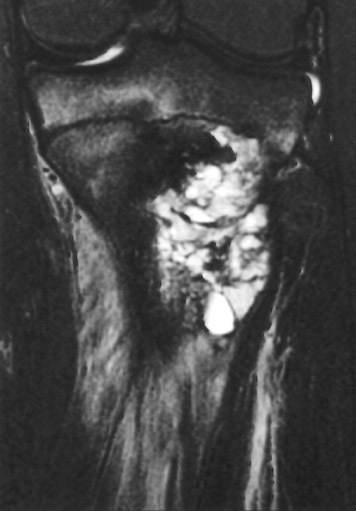 Paget 1 first described a case of telangiectatic osteosarcoma in 1854, but it was Ewing, 2 in 1922, who formally classified the tumor as a distinct histologic subtype of osteosarcoma. Differential considerations for telangiectatic osteosarcoma during the radiographic evaluation include aneurysmal bone cyst, giant cell tumor, Ewing's sarcoma, angiosarcoma, and solitary bone cyst. Murphey et al 5 have reported that when subtle osteoid formation is seen in the peripheral portion of the tumor on CT or when enhancement with intravenous contrast is seen on CT or MRI in the same region, telangiectatic osteosarcoma can be differentiated from aneurysmal bone cyst, which is the lesion most often confused with telangiectatic osteosarcoma. 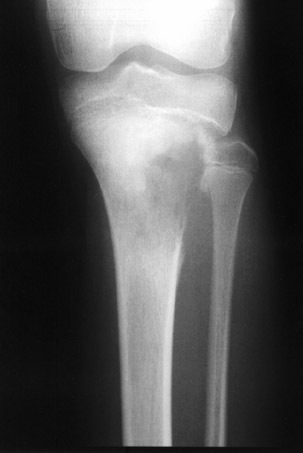 Telangiectatic osteosarcoma is a rare malignant bone tumor. The location, prognosis, and treatment of this unusual lesion mirror that of conventional osteosarcoma. Fluid-fluid levels and areas of hemorrhage are typically seen on MRI along with aggressive radiographic features, such as periosteal reaction, wide zone of transition, cortical destruction, and soft-tissue mass.